Photo: Peter B. Appeldorn House, ca. 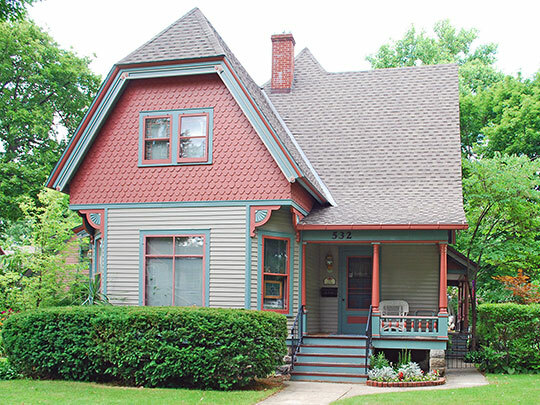 1895, 532 Village Street, Kalamazoo, MI. Listed on the National Register of Historic Places in 1983. Photographed by User:Andrew Jameson (own work), 2010, [cc-by-3.0 (creativecommons.org/licenses/by/3.0)], via Wikimedia Commons, accessed July, 2014. Kalamazoo County Administrative Offices are located at 201 West Kalamazoo Avenue, Kalamazoo, MI 49007; phone: 269-383-8840. The county was first organized in 1830. The county seat (Kalamazoo, then named Bronson Village) was designated in 1831.